There's no question that graphene is a really cool material. It's the thinnest substance ever made, a one-atom-thick sheet of carbon atoms arranged in a hexagonal honeycomb pattern. Although it's as stiff as diamond and hundreds of times stronger than steel, it's flexible and stretchable. On top of that, it conducts electricity faster at room temperature than any other known material and it can convert light of any wavelength into a current. Finding a way to make use of those properties has proven to be an enormous challenge, however. Graphene's extreme thinness makes it complicated and expensive to produce in large sheets, especially large sheets with a minimum of flaws. In addition, no one has devised effective industrial methods for handling a material so thin. Beyond that, one of graphene's greatest strengths -- its extreme conductivity -- is also one of its greatest weaknesses. Once electrical current starts flowing through graphene, it's very hard to turn it on and off, a vital requirement in digital electronics. According to theoretical studies, it is possible to turn the conductivity of graphene on and off if it is constrained into a narrow channel, a graphene nanoribbon. However, the practical realization of these nanoribbons is challenging because of their extremely small size -- their width is about 100,000 times smaller than the diameter of an average human hair. Now, however, at least some of those challenges may have found an answer in recent research performed at the University of Nebraska-Lincoln. A team of scientists led by Alexander Sinitskii has developed a chemical approach to mass producing graphene nanoribbons, a process that may provide an avenue to harnessing graphene's conductivity. 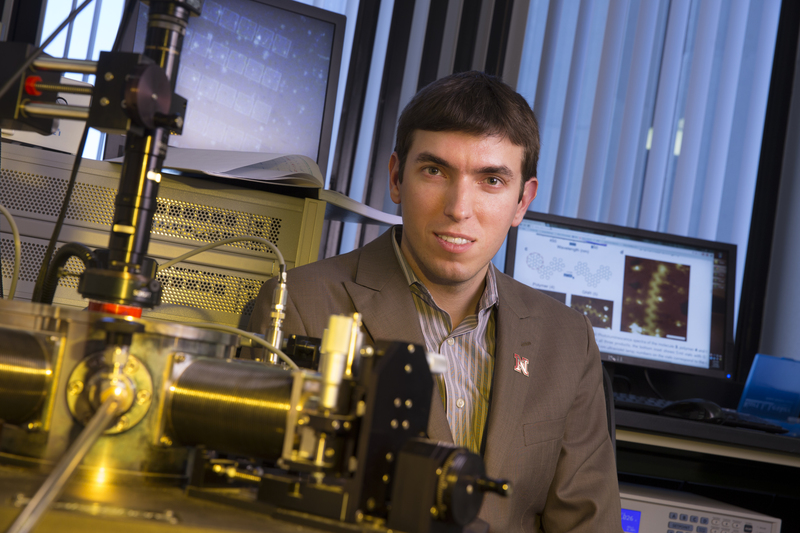 Sinitskii, an assistant professor of chemistry with a dual appointment in UNL's Nebraska Center for Materials and Nanoscience, said previous efforts by his and other research groups at creating graphene nanoribbons followed a top-down approach, using lithography and etching process to try to cut ribbons out of graphene sheets. While those processes work well in the semiconductor industry, where silicon transistor features as small as 22 nanometers (22 billionths of a meter) are carved from large silicon crystals, they don't work with graphene nanoribbons, which need to be as narrow as 2 nanometers, Sinitskii said. Consequently, he and his collaborators tried a different, ultimately successful approach that they described in the Feb. 10 issue of Nature Communications, the online multidisciplinary journal of the Nature Publishing Group. "Instead of starting with a large sheet of graphene and trying to cut it down to something small -- the essence of a top-down approach -- we decided to use a bottom-up approach, making small graphene nanoribbons by coupling even smaller organic molecules," Sinitskii said. "When you develop a method for making graphene nanoribbons, there are two problems that you need to solve: how to fabricate very narrow ribbons with atomic precision and how to fabricate them in large quantities. The method that we developed solves both these problems. The whole process is done by wet chemistry in a flask, and, it can be easily scaled up. We can make a gram, a kilogram, essentially any amount of material that's necessary"
Producing nanoscale ribbons of graphene is an essential step in putting the substance to work in all manner of electrical devices, Sinitskii said, because the ribbons have tunable electronic properties. "We are testing these ribbons for applications in electronics, gas sensors and solar cells, often in collaboration with other UNL researchers," he said. "The fact that we could tune the electronic properties of graphene nanoribbons by changing the synthetic conditions is very beneficial for these applications. And for practical applications, it is also important that this new method of the synthesis of graphene nanoribbons could be scaled up to industrial scales." Sinitskii's coauthors on the Nature Communications paper were graduate students Timothy H. Vo, Mikhail Shekhirev and Peter M. Wilson, and research associate professor Martha D. Morton of the UNL Department of Chemistry; graduate student Donna A. Kunkel, December 2012 doctoral graduate Lingmei Kong, and professors Peter Dowben and Axel Enders of the UNL Department of Physics and Astronomy; and Eric Berglund, junior chemical engineering major from Omaha. Sinitskii said Enders' lab provided imaging of the ribbons and Dowben's lab determined their spectroscopic characterization. The research was funded by the Nebraska Center for Energy Sciences Research and performed through the Nebraska Center for Materials and Nanoscience at UNL.